Home>News and Media>Connect with VTA>New Year, New Buses! With the start of the New Year, VTA is rolling out 29 new, sixty-foot articulated, clean energy buses from New Flyer of America Inc. These buses will replace the older vehicles that currently operate on VTA’s Rapid 522 Line along El Camino Real and also serve the Alum Rock-Santa Clara bus rapid transit corridor. In addition to meeting all the Americans with Disabilities Act (ADA) accessibility requirements, these buses provides VTA’s passengers with benefits including free Wi-Fi, added interior and exterior bicycle capacity, and more comfortable seating. With future installation of Clipper Card readers in the rear door of the bus, boarding will become more efficient through multi-door fare payment access. Cash only customers still need to enter at the front door. Powered by hybrid diesel-electric technology, the new buses bring a responsible, energy-saving alternative to diesel buses. The “522 Blue” articulated buses provide 95% lower nitrogen oxide emissions and 80% lower particulate matter emissions compared to diesel buses. VTA anticipates 25% better fuel economy which is similar to the results already being experienced with diesel-electric hybrid technology first introduced into the bus fleet in November 2010. 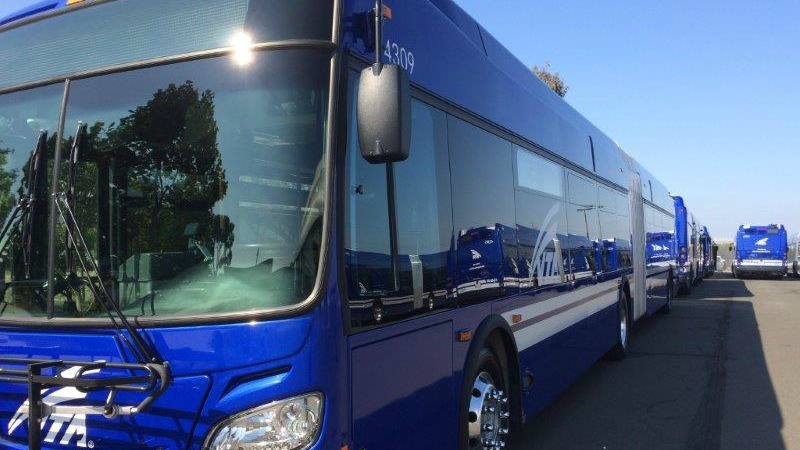 VTA's entire bus fleet is now 40% clean energy based with the addition of the new 522 Blues. Share a photo of our new blue Rapid 522 buses on Instagram, Twitter or our Facebook page and tag it #VTARapid and #522blue. The first 15 who share will win a pair of tickets to Downtown Ice! No purchase necessary to participate. Entrants must be 18 years or older to win. Inappropriate or offensive images will be disqualified and removed. The contest is open to all Santa Clara County residents excluding VTA employees and their immediate families. No substitutions or exchanges are permitted. Limit one per person. Winners will receive prize notification via social media, phone or email and can claim their prize within 7 days of notification at VTA’s River Oaks offices at 3331 N. First St., San Jose, CA, between 8 a.m. and 5 p.m. If winning entrants of any prize cannot be contacted, fails to claim the prize, or is ineligible, he/she will forfeit that prize and the prize will be awarded to the next winner. Limit one prize per winner. Acceptance of a prize constitutes permission for VTA to use the winner’s name and photo for advertising and promotional purposes without compensation.